GRAND RAPIDS, Mich., May 14, 2015—For the first time ever, the American Cancer Society, Susan G. Komen Michigan, and Gilda’s Club Grand Rapids have come together collectively and will participate in an event that will benefit not just one charity, but the overall breast cancer awareness movement. The three charities have been named those that will benefit from the premiere party of Breast Cancer Awareness Month – the West Michigan Woman “Wine & Wig Gala” on Saturday, October 10, 2015, at Bridgewater Place in Grand Rapids, Michigan. This is the first time that West Michigan Woman has broadened its efforts of “Wine & Wig” to support an entire cause instead of one charity. “The programs we offer on a local level compliment the programs and services offered by Komen Michigan and Gilda’s Clubs. We don’t overlap what we do in West Michigan and we each fill a vital need,” said American Cancer Society Community Manager Renee Ricard-Burmeister. Wine & Wig is a whimsical event where attendees enjoy food, wine, and a silent auction all while wearing wigs as a sign of solidarity with those coping with breast cancer or a cancer treatment that causes hair loss. 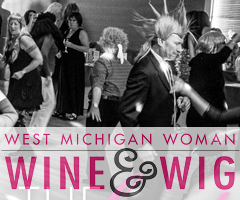 West Michigan Woman “Wine & Wig” was established in 2013 to show financial support for organizations whose mission is dedicated to improving the lives of local women in the West Michigan community, all while having fun. More than 175 people attend each year. Sponsorships are available by contacting Angie Dykstra at angie@serendipity-media.com or (616) 458-8371. Tickets will go on sale this summer. For more information visit http://westmichiganwoman.com/wineandwig. West Michigan Woman is a magazine and website dedicated to local, professional, and influential women in the Greater Grand Rapids, Holland, and Muskegon communities. The free print magazine, available only by subscription, is published and mailed bimonthly. Visit www.westmichiganwoman.com for more information. The Society relies on the strength of approximately 2.5 million dedicated volunteers. Supported by professional staff, Society volunteers drive every part of our mission, helping people stay well and get well, by finding cures, and by fighting back. Stay well: We help people take steps to prevent cancer or find it at its earliest, most treatable stage. Get well: We’re available around the clock to help people through every step of their cancer experience. Find cures: We fund and conduct research that helps us better understand, prevent, and find cures for cancer. Fight back: We work with lawmakers to pass laws to defeat cancer and rally communities worldwide to join the fight. For more information, we are available 24/7 at 800-227-2345 or visit www.cancer.org. Gilda’s Club Grand Rapids provides free emotional healthcare to children adults, families and friends on any kind of cancer journey or those grieving the death of someone in their life due to any cause. The comprehensive program, delivered by licensed healthcare professionals includes education, structured sharing times, networking, lectures, workshops and social activities. Gilda’s Club Grand Rapids is one of the largest and busiest of the 50 affiliates in North America. Each Gilda’s Club and affiliate is indepentedly owned and operated with all funds staying local. The organization runs entirely on charitable donations and currently serves more than 10,000 individuals each year at its clubhouses in Grand Rapids and Lowell, Mich., in various schools and in community centers. For more information, visit www.gildasclubgr.org.